Scientists at the University of Georgia Skidaway Institute of Oceanography joined researchers around the globe in a worldwide Ocean Sampling Day on Sunday, June 21, the summer solstice. 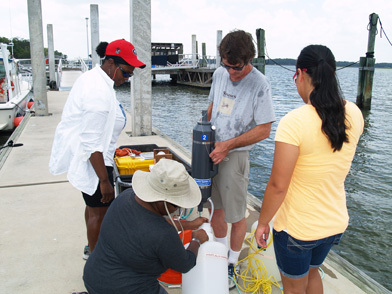 This was the second year Skidaway researchers have participated in the Ocean Sampling Day event. The first was conducted last year, also on the summer solstice. The event focuses on simultaneous sampling of microbes in ocean, coastal and Great Lakes waters. This year, 191 marine research locations—from the Rothera Research Station in Antarctica to Göteborg University in Sweden—participated. The sampling program supports international missions to provide information on the diversity of microbes, their function and their potential economic benefits. “It’s a global effort to take a snapshot of microbes across the world’s oceans at the same time, on the same day, in this case, the summer solstice,” said Skidaway Institute professor Marc Frischer. The Skidaway Institute team transfers a water sample from the Skidaway River during Ocean Sampling Day. Frischer cited the significance of the project by describing microbes as the “engines of our planet” and said half the oxygen in the atmosphere is produced by microbes in the ocean. Skidaway Institute scientists collected samples at two locations. One team collected and processed samples from the Skidaway River estuary immediately adjacent to the Skidaway Institute campus. That also served as part of an ongoing water-quality monitoring program Skidaway Institute has supported for more than 25 years. A second group teamed up with scientists from the National Oceanic and Atmospheric Administration Gray’s Reef National Marine Sanctuary and collected samples from Gray’s Reef. The 14,000-acre marine sanctuary is located about 17 miles off the Sapelo Island coast. One goal of the global project is to note the commonalities and the differences among the microbial communities around the globe. Some of those differences were seen just in the samples collected at Gray’s Reef and at the Skidaway campus, two sites only 40 miles apart. Much of the fieldwork at both Skidaway Institute and Gray’s Reef was handled by undergraduate college students gaining research experience at Skidaway Institute this summer. These included students from UGA and Savannah State University’s Research Experience for Undergraduates program. All samples and data were sent to Bremen, Germany, for DNA extraction and sequencing to ensure maximum comparability. The resulting data will be made publicly available as soon as quality checks are finished. These cumulative samples, related in time, space and environmental parameters, will provide insights into fundamental rules describing microbial diversity and function and contribute to the blue, or oceanic, economy through the identification of novel, ocean-derived biotechnologies. Ocean Sampling Day was jointly coordinated by Jacobs University in Bremen, Germany, and the University of Oxford in the U.K. and is part of the European Union-funded Ocean of Tomorrow research project Micro B3. Additional information on the global Ocean Sampling Day project is available at www.microb3.eu/osd.